The 'Links from an external page (other web sites except search engines) ' section on the few awstats installations I get to look at has been chaotic the past few months. Tonnes of referral spam overshadow any useful information in the `links from an external page` section. AWstats comes with a simple mechanism to block ( not include referral spam ) based on a black-list. To enable referral spam blocking set the SkipReferrersBlackList var-directive to the path of a file containing the spam domains you want to exclude. However, this change is effective only for new updates. I wrote a little script that can clean up awstats logs from referral spam using the same blacklist.txt file used by the `SkipReferrersBlackList`. set $blacklist to the path of your blacklist.txt. You may change $bl_subdomain to 0 if you don't want to get rid off sub-domains of blacklisted domains. To print-log the count of referral spam links removed to the bottom of the awstatsYYMMMM.example.com.txt file set $rlog to 1. The awstats logs files are usually in the awstats data directory and usually look like awstats062013.example.com.txt. The clean_awstats_rspam.pl script will read a log file and print to the standard out a `clean` log. You will have to direct the output to an intermediate log file, copy the intermediate log file to the original and then refresh your awstats page. Notes on adding the ipduh_intel simple plugin to awstats on CentOS. to every awstats.name.tld.conf configuration file in /etc/awstats. in every awstats.name.tld.conf configuration file in /etc/awstats. PTR DNSLLookup is slow and useless if not hurtful. Someone can easily put whatever.whatever , googlebot.google.com , or i.am.you.net in the PTR of an IP address. The best persistent information of a visit ( the IP address ) is discarded when DNSLookup is used. Also when DNSLookup is enabled the ipduh_intel plugin does not work well --it is a feature protecting you from silly features. Vi Improved , Vim , is a just right programmer's editor. This is not a good place to learn how to use or about the vim editor -- if you are starting with vim try here and here -- This is not even a good ,yet another, vim cheat-sheet. It is just a list of stuff that I like about vim and I think that you should know if you are using vim to write programs. >> NMode: Moves current line one Tab to the right. << NMode: Moves current line one Tab to the left. J NMode: Joins current line with the next line. :! : See out of External Command entered after ! :r! : Insert output of the external command entered after ! yes! an ip lookup taking more than 1 second to respond is weird! I have been using 2x2 MIMO Nv2 on a few ~1km, ~2km, ~5km links for months and I always wanted to quantify my perceptions of how good I think it is. This is a post with low-on-effort bandwidth and latency measurements on a 2x2 MIMO wireless link using 802.11 N and Nv2. The link used is a point to point ~1km link in the 5GHz band used by the Athens Wireless Metropolitan Network (AWMN). Later this week I will add a another wireless interface on the other side and use the same hardware on my side for one more point-to-point link. Then, I will repeat the same measurements. We are trying to find out how good Nv2 really is. The Nv2 wireless protocol is a proprietary Time Division Multiple Access ( TDMA ) protocol available on MikrotTik-routerOS systems with Atheros based cards. Ubiquity has a TDMA protocol called airMAX. RouterOS systems come with a Bandwidth Test Server by default. However, I think that putting the Bandwidth Test Server and the Bandwidth Test Client on other systems `behind` the routers produces accurate results. Especially, when it comes to TCP bandwidth throughput testing using little busy routers. 80cm off-axis --offset-- satellite dishes and double polarization `awmn-nvac` type feeders are used on both sides. One of the routers is a PC and the other router is a MIPS machine (RB433GL). Unfortunately, at this moment the PC router is connected to the iperf server in his LAN using a Fast Ethernet 100Mb/s NIC. 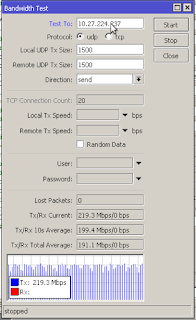 Hence, I have to use the Bandwidth Server and the Bandwidth Tester made by MikroTik. Gladly, the Standalone MikroTik Windows Bandwidth Test runs on Linux with Wine and the LAN bottleneck is on the PC router side. The MIPS machine has a Gigabit NIC and it is connected to a Gigabit LAN. The PC router is an x86 at 2673MHz and the MIPS router is a RB433GL at 680MHz. 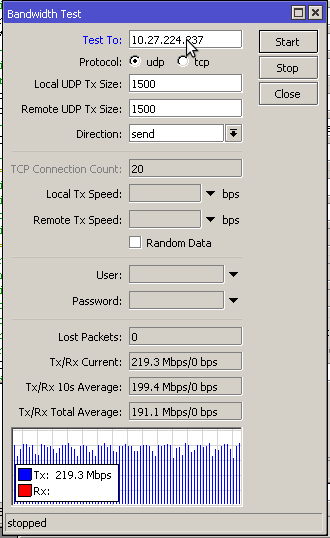 For the UDP tests I will just use the Bandwidth Servers and Clients on the routers. For the TCP tests I will use the Bandwidth Server on the PC router and a Bandwidth Client on a PC behind the MIPS router. PING 10.21.241.67 (10.21.241.67) 56(84) bytes of data. From the Client to the AP. PING 10.27.224.237 (10.27.224.237) 56(84) bytes of data. Ping while testing TCP bandwidth throughput. With one client to the AP Nv2 increases the latency on the link when there is not traffic but behaves well --in terms of latency-- when we stress the link using a bandwidth tester. Hmm, Nv2 seems better already ... more tests by me , hence suffering ( sorry ) for the West and South West Athens Neighborhoods are coming. I am using a KVM that has redundant Internet Connectivity, redundant AWMN Connectivity and does both the AWMN routing and the Hybrid Internet-AWMN DNS resolving. This way, if the KVM ceases to exist in the AWMN so does the 10.0.0.1/32 route to it. Add 10.0.0.1 to the loopback interface. Cool now add this BGP peer to your other routers and get rid off any 0/0 route in configuration files other than the zebra. Obviously you do not need any 10/8 route any more. Notes on setting simple static key OpenVPN tunnels that work over wireless networks. You may find it useful to run the following commands in a screen or another ssh session ( in case you are allergic to screen ). PING ipduh.com (85.25.242.245) 56(84) bytes of data.